Good morning! 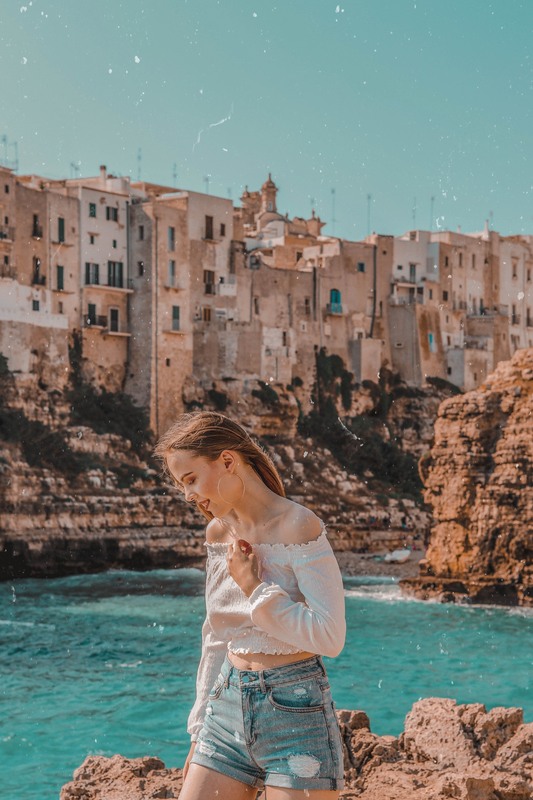 I have just got up and now I'm ready to share some of the most exciting moments from a half a day trip to Polignano a Mare. It's been almost a month since I was there but all of the memories are so bright that I feel like I was there yesterday. When we were going to Bari, we knew that we're going to travel a lot there and see as much as possible during these three days. 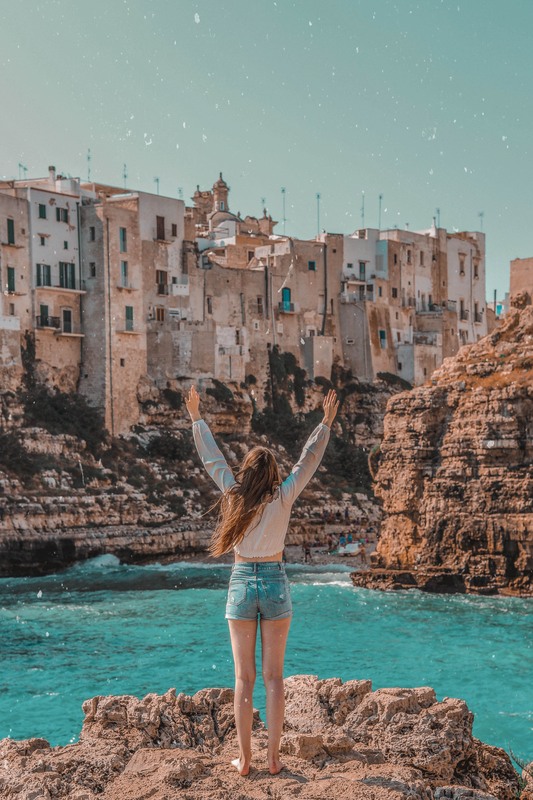 One of the stops of ours were Polignano a Mare. It is a beautiful sea town with an amazing beach surrounded by cliffs. 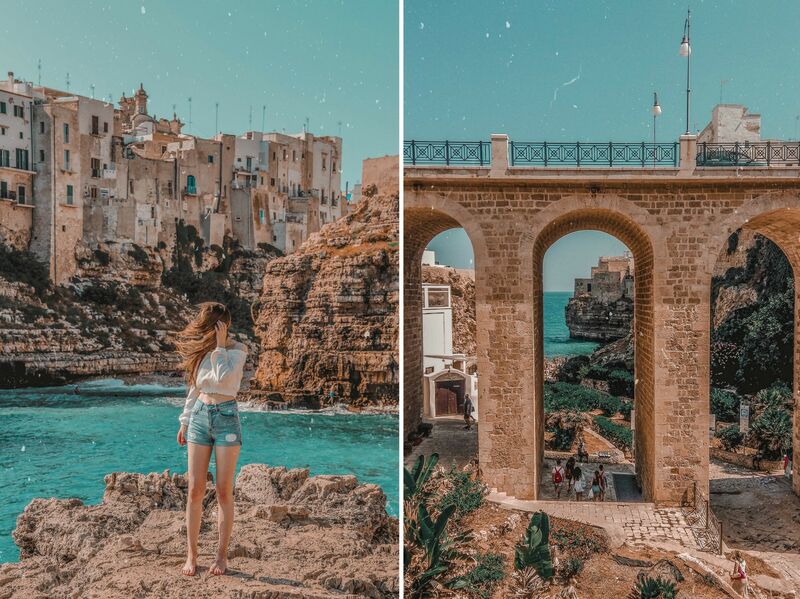 Polignano a Mare is famous by its beach and it is even one of the main atrractions in Puglia, so we wanted to get there as early as possible to take some shots on cliffs. We got up at 6.30 am and left to the train station. It is so easy to buy train tickets there using ticket machines (English is available). 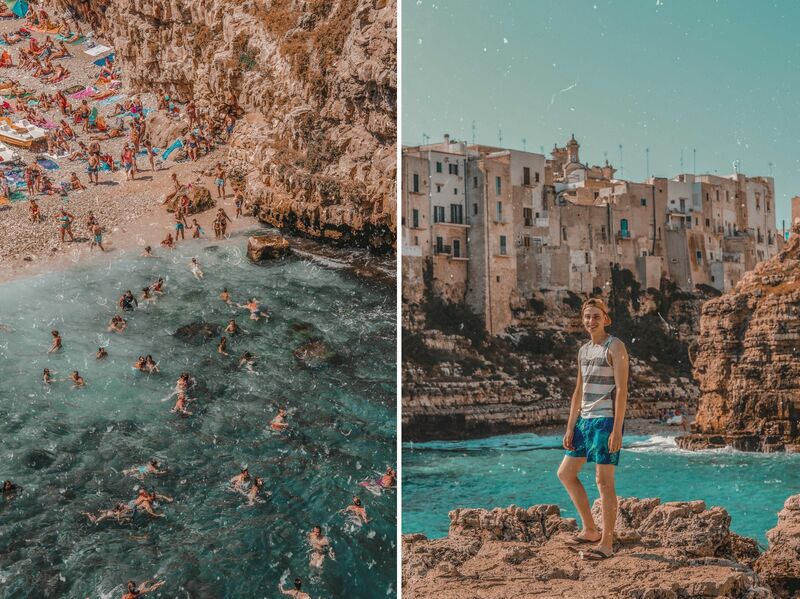 It costs only 2.5 euros for a person to reach Polignano a Mare from Bari and takes about 30 minutes. Trains leave very often so there is not a problem if you're late. It is about 10 minutes road to a beach called Lama Monachile from a station. In the early morning there are some people out there drinking esspreso (as usual hahaha). As Tomas and I are not the ones that love coffee (more like tea persons), we chose to try Italian ice-cream. It was so hot and ice-cream looked the best decision to fresh us up, but after they got melted so quickly it looked as a bad decision after all. We kind of easily found the beach without looking at the map. It was so breathtaking. We got onto cliffs and took hundreds of pictures. 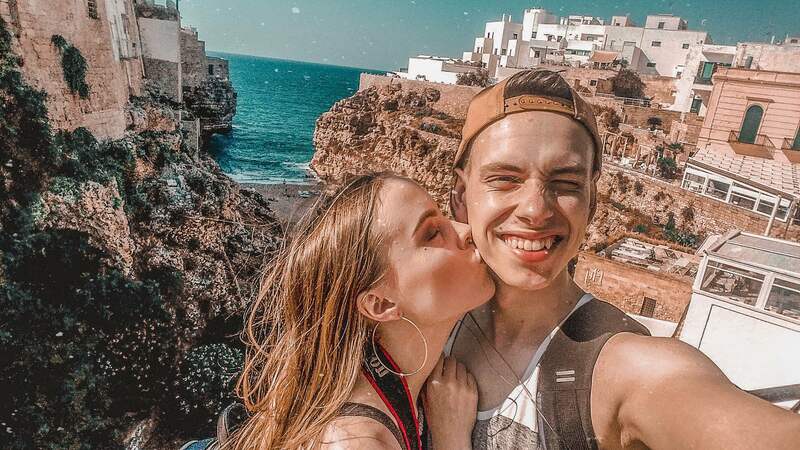 It was a little bit pitty that there was nobody to take pictures of us together, so instead of that we took millions of selfies hahaha. After that we got to the famous beach. We thought about dipping in the water but only Tomas did that because it was so windy there and I didn't feel the heat anymore. I stayed on the stoned beach for a while till Tomas got back. 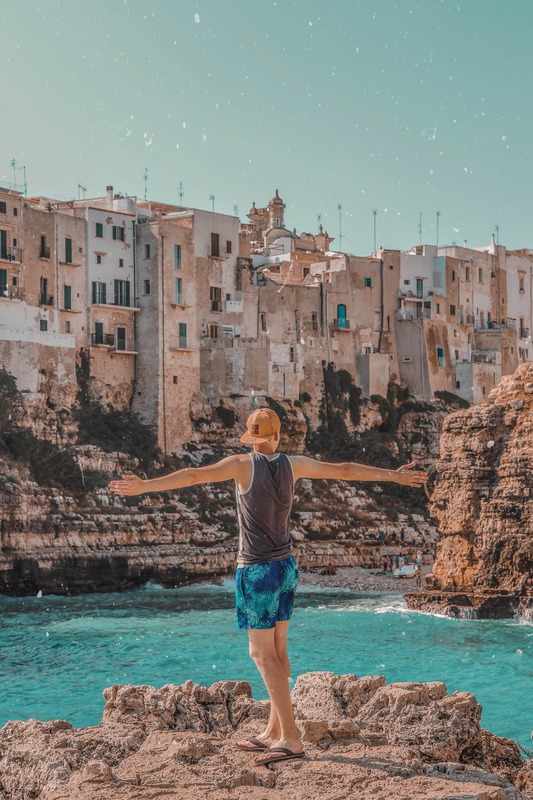 The waves were so high and strong that he couldn't swim properly, especially when the bottom is covered by rocks and it is hard to stay on feet. Lama Monachile is so beautiful. It even has a cave there where people jump off to the water. We didn't try to do that 'cause we're both are not very good swimmers (a little bit afraid of doing that hahaha). But it was so wonderful to stand there and see how beautiful world can be. After exploring the town, we felt hungry and got back to the town center to search for a cafe. It was so hard during the trip to find a proper place to eat because there people only drink espresso! And the sandwiches there are so expensive (even McDonald's). So we got back to the same place where we had bought ice-cream. There was a lovely girl working there that didn't speak in English but understood everything we asked. She even understood that I'm searching for a place to charge my phone and she charged it at the bar. I was so thankful. It was a half of our second day in Puglia. The other half we spent in Monopoli and Alberobello. So stay tuned to hear about that!